This is a hotly debated topic in the world of wedding planning and femininity. Whether or not you, as a bride, should change your name when you get married. Should you take your husband's name? Should you keep your maiden name? What about a hyphenated surname? This is an INCREDIBLY personal decision. Your name is your identity. 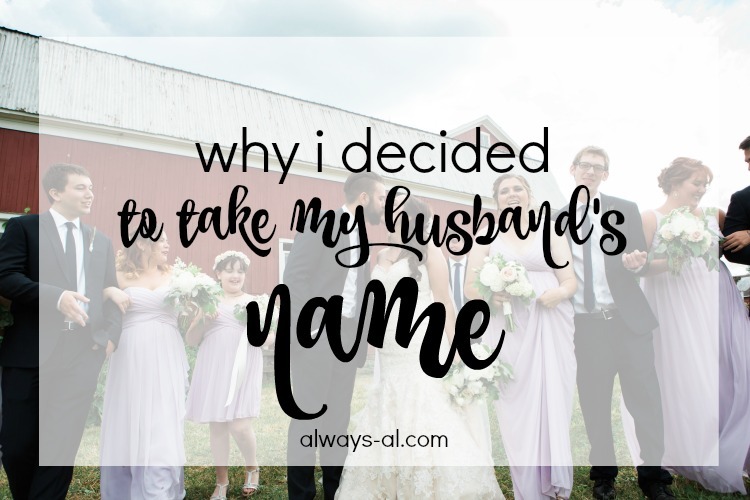 Everyone has their own reasons why they want to, or don't want to change their name when they get married. I love reading and hearing about why women made the choice they did, so I decided to share mine with you. I never thought about keeping my maiden name until I was in my 20s. I had just always been "Alex Stacey," and marriage wasn't really on the horizon yet. I didn't have to think about it. When Dave and I got more serious and knew that marriage was in the future, I started to think about it. I thought it would be hard to transition to a new name, and I liked how my name sounded with my maiden name in it. But then I started to really notice something. Since I had a first name as a surname, people would often get confused and call me "Stacey." Even if they were reading it. A couple of times when asked my last name and answered accordingly, I got "No I said your LAST name." Guys, that is really freaking annoying. Yes, I do know what my last name is actually. I'm not the one who is confused here. Very quickly I started thinking about taking Dave's last name. It's kind of a tough one to pronounce, but it is INFINITELY better than someone just assuming your name is what it isn't. As I thought more and more about it, I really started to get attached to the idea. We always joke around about how we are #teamwhy, and I wanted to be part of that team. I wanted us to be a family unit, not just in feel, but in name too. I have so much respect for those of you who choose to keep your surname when you get married. I don't think I could have done it. For me, that was really the biggest change when we got married. Although I did keep my maiden name as my middle name, so I think that counts a little bit! Speaking of changing your name... I have a great giveaway on my Instagram for anyone looking to change theirs! I'm giving one lucky winner credit for a print-at-home package from HitchSwitch! I had a great experience with HitchSwitch (which you can check out here), and I am so excited to offer this to one lucky person. Go check it out!